After last week’s horrible 14 mile run, I really had no idea what to expect from this long run. Last week everything was so good till the mile 13 marker, then something broke inside me. I just sat down, and really started to think why am I doing this to myself? Is this all really worth it? Probably the heat didn’t help. But at the end I managed to do the run in 2hrs 59mins, so it wasn’t that bad. I was supposed to do this 18 miles on the Saturday. But because of the summer holidays at work, I’ve been asked to work. I rarely work on weekends, so this thrown my plans up a bit. But the extra money will be good to spend in Berlin / Chicago. But it also meant that I won’t have a lay in day all week. On Sunday my alarm went off at 4am, to my surprise I had no issues waking up. Got all my running gear ready the previous evening, so just had to dress up, eat my porridge, make my drinks and off I went. I left the house at 4.50am. A few weeks ago when I was planning my 20miler long run , which will be in 2 weeks time , my coach suggested do run a few laps instead on 1 big one. By doing that its easier to get my refreshments done, and also if I need any toilet break I can sort that out as well. I’ve planned out a 6 mile look by our house, mostly flat, and only had to cross the main road 3 times / loop. It was through housing estates, but because I was planning to run early I didn’t really think this will be an issue. So off I went at 4.50am. To my surprise this run went so much better straight from the beginning than my other one from last week. In the first hour I was wearing my head torch, and high-vis, because of the darkens. To my surprise I managed to complete my first 5 miles just under an hour, 59mins 30seconds. 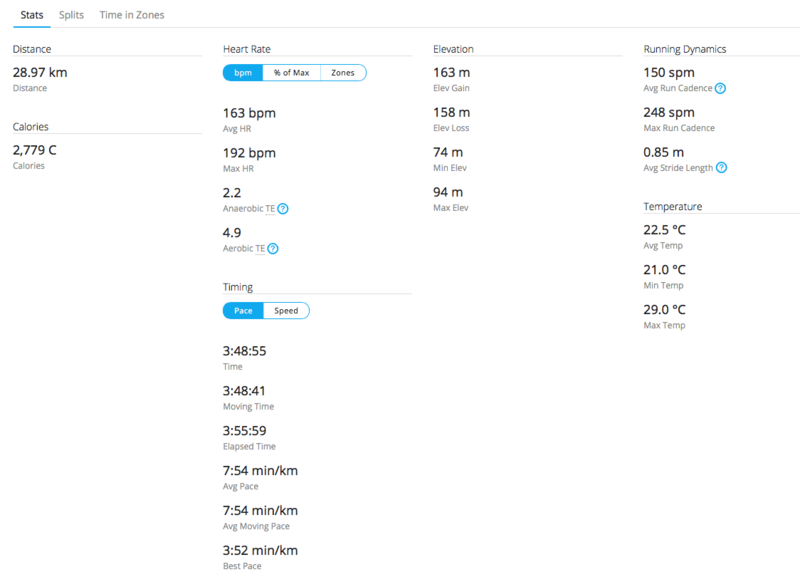 Looking back at my run details in Garmin Connect, my fastest run pace was between the 5:21 – 5:57 mins/km mark. But because I do Jeffing ( run – walk ) my average pace were in the 7:21 – 7:47 mins/km mark. It turns out my walk pace is usually around the 11mins/km marker. My fastest km was in just before mile 5, which was an awesome 7:01mins/ km. By the time I’ve started my second lap it started to rain. But I didn’t mind that at all. It was nice and cold, finally the perfect running weather. When I started lap nr2 I re filled all my carry on water bottles. By doing this I only had to carry 2 x 220ml small bottles. Instead of the massive 500ml ones. To be honest it was mentally hard to continue every time I’ve run past our house. But I knew that I had to get this run done. If I can run a whole 18miles alone I’ll be totally fine on race day. I’ve run many 18-20milers before but all were in race conditions, unfortunately for this training cycle I didn’t find any local races. So I have to tackle all of this alone. So during my second loop I was still going strong, My average pace was varied between 7:13 and 7.36mins/km. Still really happy with that. At mile 10.03 I was still under the 2hrs mark. This is the second time in my whole life. Whoohooo. I think because of the light rain and proper refreshments, I still felt really strong. I’ve started my 3rd loop and I knew I’ve got this, but then after 2 miles something hit me. My legs started to hurt, and my mind started to play games with my. Just to usual stuff, questioning myself constantly. Because of this, my pace slowed down a bit. My running pace got about 20 seconds slower, so instead of my 5:30 run pace they turned into a 6.14-6.41. Also my walk pace dropped to a 14-15mins/km, which meant my average pace slowed down to 8-8.30mins/km mark. I think it’s all have to do with me running all alone. When you are in a race, there are other runners who supporting you all around the course, and of course there are the spectators, who can give you a massive boost. I hoping that on race day I’ll be able to keep up my faster pace for a longer period of time. Because of my slowing down , when I got to the next hour mark, I only completed 4.7miles, instead of the 5 I’ve done before. To be honest it wasn’t much slower. It took me 1hr 2mins to do the whole 5 miles. this got me up to the 15miler mark, in 3hrs and 2 minutes. I am really happy with that, because last week I’ve only done 14 miles in 3hrs, so this time I was a whole mile faster. The last 3 miles were uneventful. I kept thinking it’s only a parkrun to go. I can easily do a parkrun, even with blindfolded. 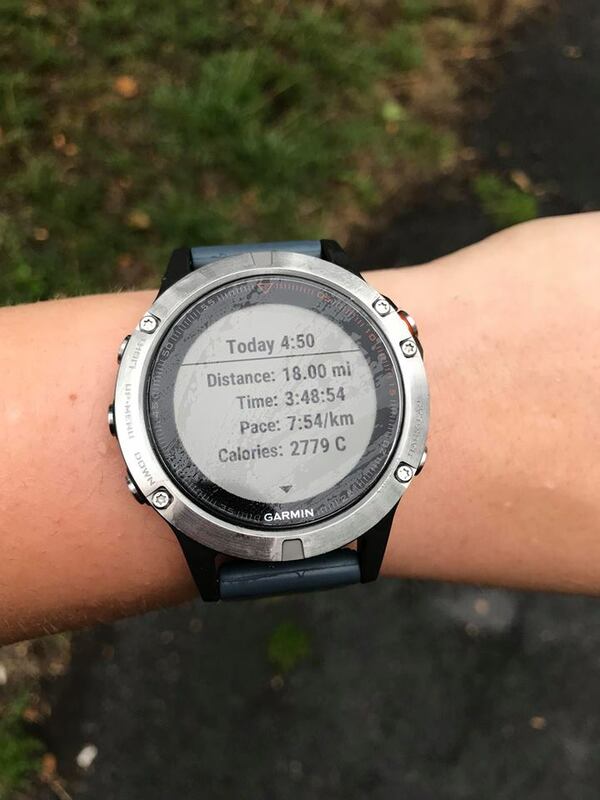 When my watch beeped at mile 18 I felt a massive relief, I’ve done it. I’ve done something I never done alone. It’s great, it’s awesome, I happy with that. I think on race day I’ll be able to squeeze in another mile and still be under the 4hrs mark. Then I only have to do 7 more miles in 2 hours, to still be under my goal 6hours mark. At this moment it feels like it’s totally achievable. Today I’ve won. I beat my own mind. My mind which is my worst enemy, I was stronger. Running is not hard physically, it’s much harder mentally. My legs want to go, my heart telling me I can go, but if my mind tells me I can’t it takes a whole lot of courage to beat that. On this day I was better, I was stronger. I’ve attached a few photos comparing with my other 18 mile runs. unfortunately London didn’t provide an 18 miler split, so will use the 30k split for that. But New York had an 18 mile split so can provide that. In London it took me 04:43:51 to run 30km ( 18.6miles) , so that’s a bit longer than my current 18 miler, but as you can see that took me 55 minutes longer than this run. Luckily the New York marathon does provide an 18 mile split, in the results database. As you can see in the photo below, I was faster in the race compared to London, but that 18 mile still took me longer to run than my current run. It took me exactly 04:13:09. Which means my current run is 30minutes faster than that. I do feel really positive about this run, I think I’ve said that like 100 times already. But it does look like that hard work do pays off. I’ve put so many mileage in since may, and even with a few missed session I can see I’ll get to my goal. This week I only have to run 12 miles on saturday, but a week after that I’ll be out on my longest run, 20 mile. Because of this positive 18 miles I’m not worried about that at all.